The Advanced Certificate in Oncology Social Work Practice is led by a team of nationally recognized oncology social workers and allied health and mental health professionals with expertise in cancer research, training, and practice. Each module will be led by a renowned leader who will bring their experience and knowledge to the program. A complete list of program instructors will be available in late Spring 2018. Dr. Werner-Lin’s research addresses the intersection of genomic discovery and family life. She seeks to broaden social work’s guiding ‘person-in-environment’ framework to include genetic variation as a core feature of assessment, one in constant interaction with developmental, sociocultural, and environmental contexts. Presently, Dr. Werner-Lin’s work addressed the ethical, legal, and social implications (ELSI) of emerging genomic technologies in reproductive, pediatric, adolescent, and young adult populations with inherited cancer predisposition syndromes. Her work is among the first to explore the psychosocial challenges unique to women and men of reproductive age who carry a genetic mutation (BRCA1/2), which exposes carriers to elevated risk of hereditary breast and ovarian cancer. She holds an appointment with the Clinical Genetics Branch of the Division of Cancer Epidemiology and Genetics at the National Cancer Institute where she oversees psychosocial research addressing hereditary tumor predisposition syndromes, including Hereditary Breast and Ovarian Cancer Syndrome and Li-Fraumeni Syndrome. She is a member of the Scientific Committee governing the International Meeting on Psychosocial Aspects of Hereditary Cancer, serves on the Editorial Board of the Journal of Psychosocial Oncology, and is a Distinguished Fellow of the Society for Social Work and Research, where she serves as facilitator of the Cancer Special Interest Group, and the National Academies of Practice in Social Work. Dr. Werner-Lin received her PhD from the School of Social Service Administration at the University of Chicago. She holds a master’s degree in clinical social work from the University of Chicago, a master’s degree in human development and psychology from the Graduate School of Education at Harvard University, and a Bachelor of Arts in family studies and psychology from Wellesley College. She has presented her research at national and international conferences. She advises learners across health and mental health disciplines, teaches qualitative health research methods for the Center for Public Health Initiatives, and was recently honored by the Council on Social Work Education for outstanding mentorship. Dr. Werner-Lin has held grants to build interdisciplinary training programs in oncology, genome-based health literacy, and health care social work practice. Dr. Werner-Lin has practiced in community-based organizations providing individual, family, and group counseling and psychotherapy to families affected by cancer, and she maintains a small private practice for bereaved children, teens, and families. She conducts workshops on direct practice with families affected by cancer and parentally bereaved children, and she provides supervision to professional groups. Werner-Lin, A. & Merrill, S. & Brandt, A. (2018). Talking with children and adolescents about a BRCA mutation in the family: A developmental approach for parents. Journal of Genetic Counseling. Werner-Lin, A. & Merrill, S. (2016). A role for social workers in helping families with inherited cancer predisposition: A Case of Li-Fraumeni Syndrome. In J. McCoyd (Ed). Social Work in Healthcare Settings, 2nd Edition. Werner-Lin, A. (2015). Emerging Adults Supplemental Reading: “Cancer doesn’t have an age:” Transitions to adulthood against the backdrop of anticipated illness and loss. In McCoyd, JLM & Walter, CA (Eds) Grief and loss across the lifespan: A biopsychosocial perspective (2nd Ed.) New York: Springer Publishing. Werner-Lin, A. (2015). The oncology social worker and genomics. In. G. Christ, C. Messner & L. Behar (Eds). Handbook of Oncology Social Work. Oxford University Press: New York, NY. Werner-Lin, A. (2015). Social work with families affected by hereditary cancer. In. G. Christ, C. Messner & L. Behar (Eds). Handbook of Oncology Social Work. Oxford University Press: New York, NY. Hoskins, L.M., Werner-Lin, A., & Greene, M.H. (2014). In their own words: Treating BRCA1/2mutation-positive women in their emerging adult years (ePub). PLoS ONE, 9(2): e87696. Werner-Lin, A., Rubin, L.R., Doyle, M.H., Rapp, R., Stern, R., Savin, K., Hurley, K., & Sagi, M. (2012). ‘My funky genetics’: BRCA1/2 mutation carriers’ understanding of genetic inheritance and reproductive merger in the context of new repro-genetic technologies. Families, Systems & Health, 30(2), 166-180. Werner-Lin, A., & Biank, N.M. (2012). Holding parents so they can hold their children: Grief work with surviving spouses to support parentally bereaved children. OMEGA: Journal of Death & Dying, 66 (1) 1-16. Christina Bach, MBE, MSW, LCSW, OSW-C is a nationally known oncology social work leader. She has worked in inpatient and outpatient oncology social work settings at Penn Medicine and is currently the Psychosocial Content Editor and an Oncology Education Specialist at Oncolink.org. 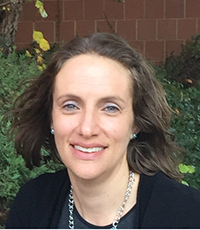 Christina’s work focuses on patient/family/healthcare provider education, distress screening response, financial toxicity and public benefits access, psychosocial issues for cancer survivors, and animal assisted interventions with cancer patients and their families. Christina is also a strong advocate of social work bioethics. She co-leads the AOSW Special Interest Group (SIG) in Ethics and teaches Bioethics for Medical Social Workers at the Penn School of Social Policy and Practice. Christina Bach is a nationally known oncology social work leader. She has worked in inpatient and outpatient oncology social work settings at Penn Medicine and is currently the Psychosocial Content Editor and an Oncology Education Specialist at Oncolink.org. Christina’s work focuses on patient/family/healthcare provider education, distress screening response, financial toxicity and public benefits access, psychosocial issues for cancer survivors, and animal assisted interventions with cancer patients and their families. Christina is also a strong advocate of social work bioethics. 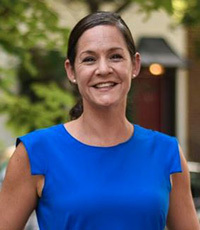 She co-leads the AOSW Special Interest Group (SIG) in Ethics and teaches Bioethics for Medical Social Workers at the Penn School of Social Policy and Practice. Eucharia Borden, MSW, LCSW, OSW-C has been an oncology social worker in the Philadelphia area for the past 10 years at Lankenau Medical Center. She earned her MSW from Temple University and has spent her career working with adults living with chronic illness. 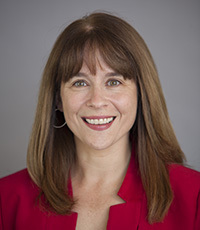 She currently serves as the President-Elect for the Association of Oncology Social Work (AOSW President in 2019) and has also served as Membership Director. Eucharia is actively involved in her local Social Work Oncology Group (SWOG); she also serves on the Oncology Nurse Advisor’s Editorial Board and was recently invited to join the Cancer Support Community of Greater Philadelphia’s Professional Advisory Board. Educating healthcare professionals about cultural humility and issues related to diversity and inclusion has been the focus of many of her articles and presentations. In addition, she is an ardent advocate for uninsured and underinsured patients to receive equal access to care. 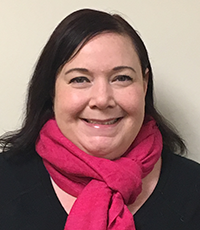 Eucharia’s work focuses primarily on providing psychosocial support and resources to patients, families, and caregivers in an outpatient setting, throughout the trajectory of diagnosis and treatment. 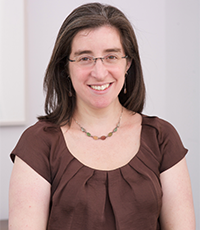 Penny Damaskos, PhD, LCSW, OSW-C, is the Director of Social Work at Memorial Sloan Kettering. Penny started her career at MSK and has served as an oncology social worker there and at other area hospitals for more than 20 years. She graduated with her Master’s from New York University‘s Silver School of Social Work and received her PhD degree from Yeshiva University. She was the recipient of a American Cancer Society Doctoral Training Grant to support her studies her dissertation focused on the presence of resilience in oncology social work. In 2013, Penny received the Association of Oncology Social Work’s Leadership in Oncology Social Work award and in 2015 she received the Project of Death in America, (PDIA) Career Achievement Award. Penny co-authored several chapters in the recently published Oxford Handbook of Oncology Social Work. Dr. Fineberg, is Interim Director for the PhD Program and Associate Professor at Stony Brook University’s School of Social Welfare. She began her oncology social work career as a clinician, working with people facing bone marrow and stem cell transplantation, and palliative care. She earned her PhD in Social Work and Sociology from Boston University, receiving a grant from the Project on Death in America, and completed a post-doctoral fellowship in Cancer Prevention and Control Research at UCLA. She spent 5 years on faculty at the International Observatory on End of Life Care at Lancaster University, England. Dr. Fineberg has been the PI on several grants and taught students and health professionals. Her research interests are palliative and end of life care, interdisciplinary education and practice, and family conferencing. She is a past-president of AOSW and current Chair of the National Academy of Practice in Social Work. 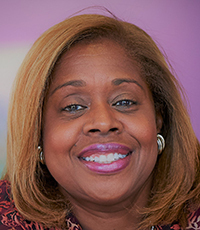 Stephanie Fooks-Parker, MSW, LSW, OSW-C received her Master of Social Work degree in 1989 from Howard University in Washington D.C. After graduation, she began her career in pediatric oncology at Johns Hopkins Hospital in Baltimore, where she worked for 2 ½ years. In 1991, she returned to her hometown of Philadelphia and Children’s Hospital of Philadelphia where she took the position of social worker with the Blood and Marrow Transplant Team. She continues in this role today as well as working with the CART/Immunotherapy Team. In addition to her work in oncology, Stephanie is one of four leaders of the Children’s Hospital of Philadelphia Youth Advisory Council and serves as chair of the Department of Patient and Family Services Communication Committee. She is also the Psychosocial Coordinator for Ronald McDonald Camp (RMC), a one-week overnight summer camp in the Poconos for oncology patients and their siblings. She has served on the American Cancer Society’s Peer Review Committee on Training Grants in Clinical Oncology Social Work. She also reviews Beyond the Cure scholarship essays annually for the National Children’s Cancer Society. In 2009, she was named Social Worker of the Year by Children’s Hospital of Philadelphia Social Work Department. This year she was named the Association of Pediatric Oncology Social Worker of the Year. Stephanie has been a member of the Association of Pediatric Oncology Social Workers since 1989 and served as Chair of its Conference Committee from 2004-2009. In May 2018 she became President of the Association of Pediatric Oncology Social Workers. She will remain in this role until May 2020. 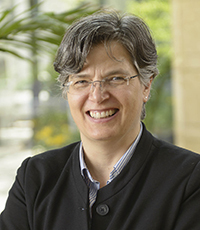 Dr. Carmen E. Guerra is Associate Professor of Medicine and the Vice Chair for Diversity and Inclusion for the Department of Medicine at the Perelman School of Medicine at the University of Pennsylvania. She is also the Associate Director of Diversity and Outreach for the Abramson Cancer Center and an Advisory Dean for Medical Students. Dr. Guerra received a bachelor of arts degree in psychobiology from New York University in 1989, a medical degree from the University of Rochester School of Medicine and Dentistry in 1993, and a Master of Science of Clinical Epidemiology from the University of Pennsylvania School of Medicine in 2006. Dr. Guerra is a general internist and cancer control researcher. Her research focuses on better understanding and overcoming the barriers to accessing cancer screening tests. Dr. Guerra has numerous awards including being a fellow of the American College of Physicians and the College of Physicians of Philadelphia, an alumnus of the Robert Wood Johnson Foundations Harold Amos Faculty Development Program, a Penn Fellow and is the recipient of the 2017 American Cancer Society St. George National Award. Dr. Guerra has served as a volunteer leader on several non-profit boards including serving as the current Board Scientific Officer of the American Cancer Society Board of Directors in 2018-2019. Lauren Kriegel received a BS in Human Development and Family Studies from The University of Rhode Island and an MSW from Columbia University School of Social Work. Lauren now works as the Bone Marrow Transplant social worker in the division of hematologic malignancies at Rutgers Cancer Institute of New Jersey. In this role, Lauren provides support and counseling to patients and family members from initial diagnosis through to post-transplant life. Lauren is responsible for assessing all patients prior to transplant and providing appropriate interventions to prepare patients for the transplant process. Lauren has started a support group designed specifically for bone marrow transplant patients to address their unique needs. Additionally, Lauren has developed a survivor panel to provide education to newly diagnosed patients. Lauren is passionate about using DBT informed practice to help patients deal with disease-related anxiety. 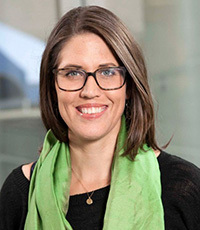 Heather Klusaritz, PhD, MSW is the Associate Director of the Center for Community and Population Health in the Department of Family Medicine and Community Health at the Perelman School of Medicine at the University of Pennsylvania. Dr. Klusaritz is also the Director of Community Engagement for UPenn’s Center for Public Health Initiatives, core faculty in the MPH program, and a Lecturer at the School of Social Policy and Practice. Dr. Klusaritz is trained clinically as a medical social worker and been engaged in care delivery at University of Pennsylvania Health System for over 15 years. Dr. Klusaritz’s research focus is at the intersection between healthcare and policy, specifically access to health care for marginalized populations and the design of health systems to eliminate disparities in health access and outcomes. Currently, she co-directs the National Center for Integrated Behavioral Health, a HRSA-funded cooperative agreement which aims to advance training in integrated models of care to improve the quality, accessibility, and effectiveness of behavioral health and substance use disorders in primary care. Dr. Klusaritz has significant teaching experience with MSW, MPH, and medical students as well as resident physician trainees in the areas of health disparities, social determinants of health inequities, health policy, and social welfare policy. Dr. Klusaritz works collaboratively with multiple community partners throughout West Philadelphia to improve the health of underserved communities and is the co-founder of a program that connects patients to critical social welfare benefits, helps navigate health system access, and engages in medical-legal advocacy. 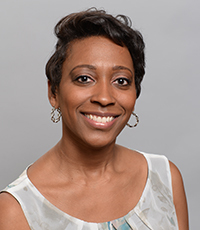 Kimarie Knowles is a licensed clinical social worker in New York and New Jersey with special training in oncology, bereavement, and group psychotherapy. She obtained a master’s degree in social work from the Catholic University of America. She completed post-graduate training programs in psychodynamic psychotherapy from The Institute for Contemporary Psychotherapy and in Psychodynamic Group Psychotherapy from the Easter Group Psychotherapy Society. She has been working at Memorial Sloan Kettering Cancer Center since 2008 and facilitates two online chats for Leukemia and Lymphoma Society. Neal Niznan received a Master of Social Work degree from Rutgers the State University of New Jersey in 1990 and a certificate in family therapy from the Multicultural Family Institute of New Jersey in 1993. Working as a family therapist at community mental health practices, he provided psychotherapy for individuals, couples and families both in New Jersey and Pennsylvania. Mr. Niznan continued his therapist role in 2000 at the Abramson Cancer Center Counseling Service at the University of Pennsylvania in Philadelphia working with patients living with serious medical illness. During this time, he also co-facilitated cancer support groups and frequently presented at numerous site specific conferences and workshops on coping with the emotional impact of cancer. Since 2009, he has provided psychosocial support and services to oncology patients receiving radiation treatment in the Department of Radiation Oncology at the Hospital of the University of Pennsylvania and facilitates the Prostate Cancer Support Group. Mr. Niznan also maintains a private psychotherapy practice in the community. Shirley’s career is dedicated to enhancing excellence in the delivery of culturally-congruent, person-centered and family-focused interprofessional care. Her education, research, and consultation efforts have led her to become an internationally recognized speaker on quality-of-life, palliative care, leadership development, and the creation of meaningful organizational change. As Principal Investigator on studies with over $3.5 million in external funding, her work has been recognized with numerous awards and disseminated through more than 100 publications and 500 professional presentations. 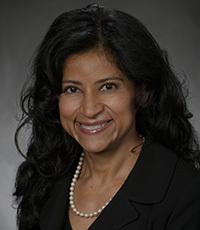 She is a California HealthCare Foundation Leadership Fellow, serves on several editorial and professional boards, and is a Distinguished Social Work Practitioner in the National Academies of Practice. Lora received her BS in psychology from Penn State University and MSW from Rutgers University. A social worker for over 25 years, she returned to clinical work in 2014 at the Sidney Kimmel Cancer Center at Jefferson, where she began her career in oncology social work in 1996. In her current role she provides support services to patients from young adults to seniors. 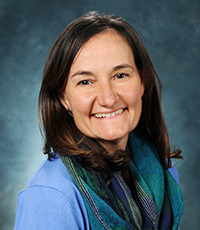 She provides psychosocial support in the multidisciplinary senior adult oncology, head and neck cancer, and cancer genetics clinics, and is a member of the lung, head, and neck, genitourinary clinical teams. Prior to her current position, she worked in continuing medical education, developing education programs for physicians, nurses, and social workers. She has presented extensively, both locally and nationally on psychosocial issues facing individuals with cancer. Allison Werner-Lin is Assistant Professor at the School of Social Policy and Practice. Her research addresses the intersection of genomic discovery and family life. Dr. Werner-Lin seeks to broaden social work’s guiding ‘person-in-environment’ framework to include genetic variation as a core feature of assessment, one in constant interaction with developmental, sociocultural, and environmental contexts. Presently, Dr. Werner-Lin’s work addressed the ethical, legal, and social implications (ELSI) of emerging genomic technologies in reproductive, pediatric, adolescent, and young adult populations. This work is funded through the National Human Genome Research Institute’s Clinical Sequencing Exploratory Research program and the Eunice Kennedy Shriver National Institute of Child Health and Human Development. Her work is among the first to explore the psychosocial challenges unique to women and men of reproductive age who carry a genetic mutation (BRCA1/2), which exposes carriers to elevated risk of hereditary breast and ovarian cancer. She holds appointments with the Clinical Genetics Branch of the Division of Cancer Epidemiology and Genetics at the National Cancer Institute where she oversees psychosocial research addressing hereditary tumor predisposition syndromes, including Li-Fraumeni Syndrome. She is a member of the Scientific Committee governing the International Meeting on Psychosocial Aspects of Hereditary Cancer. Dr. Werner-Lin partners with agencies that seeks to identify how best the rapidly evolving knowledge base of genomics may be translated into community education and outreach programs for adolescents and young adults, given the social, cognitive, and cultural contexts within which they acquire health knowledge and behaviors. She consults with the Personal Genetics Education Project (pgED.org) at Harvard Medical School to enhance and evaluate high school science curricula towards increased adolescent genomic literacy. Dr. Werner-Lin received her PhD from the School of Social Service Administration at the University of Chicago. She holds a master’s degree in clinical social work from the University of Chicago, a master’s degree in human development and psychology from the Graduate School of Education at Harvard University, and a Bachelor of Arts in family studies and psychology from Wellesley College. 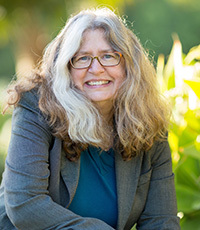 She is a Fellow of the Society for Social Work and Research and a Distinguished Scholar and Fellow of the National Academies of Practice in Social Work. She has presented her research at national and international conferences. She advises learners across health and mental health disciplines, teaches qualitative health research methods for the Center for Public Health Initiatives, and was recently honored by the Council on Social Work Education for outstanding mentorship. Dr. Werner-Lin has held training grants to build interdisciplinary training programs in oncology, genome-based health literacy, and health care social work practice. Dr. Werner-Lin has practiced in community-based organizations providing individual, family, and group counseling and psychotherapy to families affected by cancer, and she maintains a small private practice for parentally bereaved children and teens. She conducts workshops on direct practice with parentally bereaved children and provides supervision to professional groups. 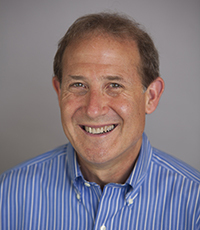 Dr. Brad Zebrack is a Professor of Social Work and Member, University of Michigan Comprehensive Cancer Center, Division of Cancer Prevention and Control, Health Behavior and Outcomes Research program. Dr. Zebrack has clinical social work experience in both pediatric and adult oncology, and has been involved in the development of peer support/advocacy programs for adolescent and young adult cancer survivors. His research interests include psychosocial and quality of life outcomes for cancer patients and supportive care service delivery. His research has been funded by the National Cancer Institute, the American Cancer Society, the Lymphoma Research Foundation, LiveStrong Foundation, and HopeLab, Inc. In 2017, Dr. Zebrack was awarded a Fulbright Scholarship for study in Australia, where he collaborated with colleagues to develop and evaluate supportive care services for adolescents and young adults affected by cancer. Dr. Zebrack is a Fellow to the American Psychosocial Oncology Society (APOS) and the Society for Social Work and Research (SSWR). He is also a recipient of the APOS Outstanding Education and Training Award (2014) and the Oncology Social Work Research Award from the Association of Oncology Social Work (2002).